Map items screen contains list of folders and items. 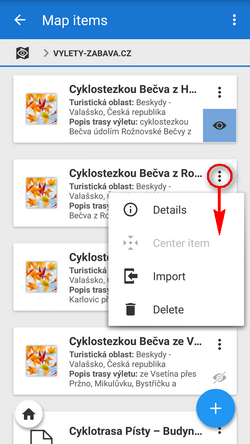 Folders are created 1) automatically during a particular process, e.g. 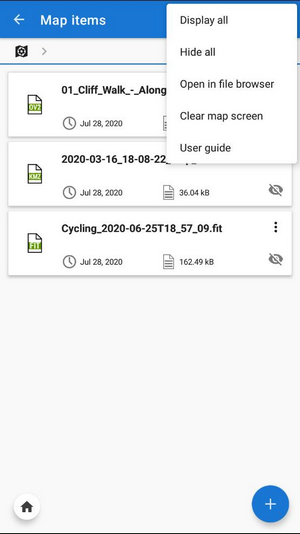 linking files from certain web services or features, e.g. map calibration. 2) other folders have to be created externally in /Locus/mapItems directory via a file manager of the device. Hide temp map items - aborts displaying of all temporary objects on map - map items, objects displayed by the Content panel, by geocaching tools etc. Details - displays item detail screen - filename, preview (centers item on the map), distance, min altitude, max altitude, date of creation, size, description etc. Import - launches import of the item, as it is described here >>. After the import the item's content does not function as an autonomous object, it is implemented in the application data manageable in the Data manager Points or Tracks tabs. another way is manual adding by tapping . 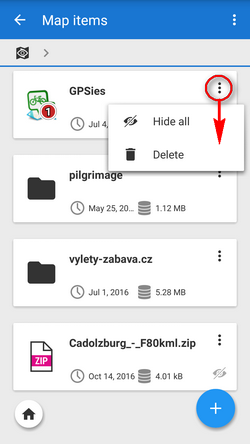 The button opens a simple file manager and you select a file from your phone memory, from external SD card, Dropbox or Google Drive. 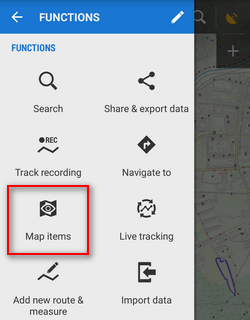 Locus can process KML, KMZ, GPX, JSON and ZIP files containing all previous.